I mentioned last week that I broke down and bought the red plaid J. Crew Chateau parka that I’d been pining for since November. It looks like it’s now sold out online at J. Crew, but I’ve discovered in the past that with diligent checking, many “sold out” items come briefly back in stock, so it may be worth your time to check back over the next few months if you’ve got your eye on this. In the meantime, it’s still available at Nordstrom (via their J. Crew collab), but as I pointed out last week, you’re not going to get as good of a deal. At least not now. However, this J. 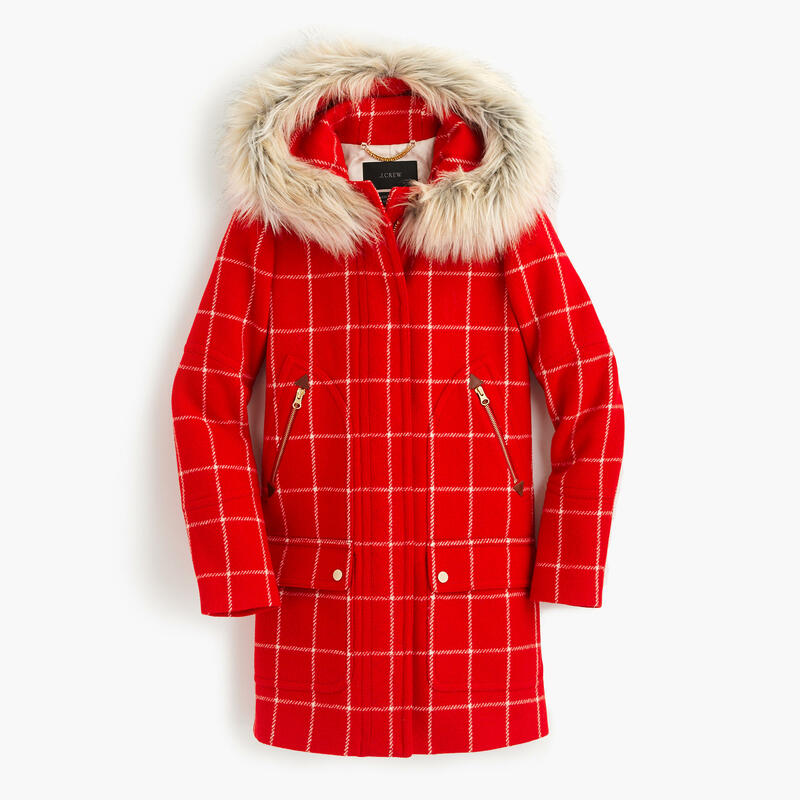 Crew Factory coat in “Electric Red” seems to be a very good substitute, especially at $150 even without any of their near-ubiquitous discounts (currently 25%, so you could get this coat for less than $115). I’ve only worn my Chateau Parka a few times, especially since it was so brutally cold in the beginning of January that I had to buy a much warmer coat than this. Survival, y’all. Last week the temps climbed for a moment to the mid-30s, and it was time for the Chateau Parka to come out. I am so terrible at taking photos for this blog. Sigh. For reference, I am 5’9″ and usually wear a size 8 or 10. I bought this coat in a 10 to have enough room for winter layers underneath. The cut is slightly A-line, so the midsection and bottom are pretty loose, but not quite a swing shape. The upper arms, however, are weirdly tight. The overall fit is still fine, but for the relative looseness of the bottom half I was surprised by the cut of the upper arms. I didn’t capture an image, but the snaps and zipper are gold. The zipper pull is oversized and chunky. 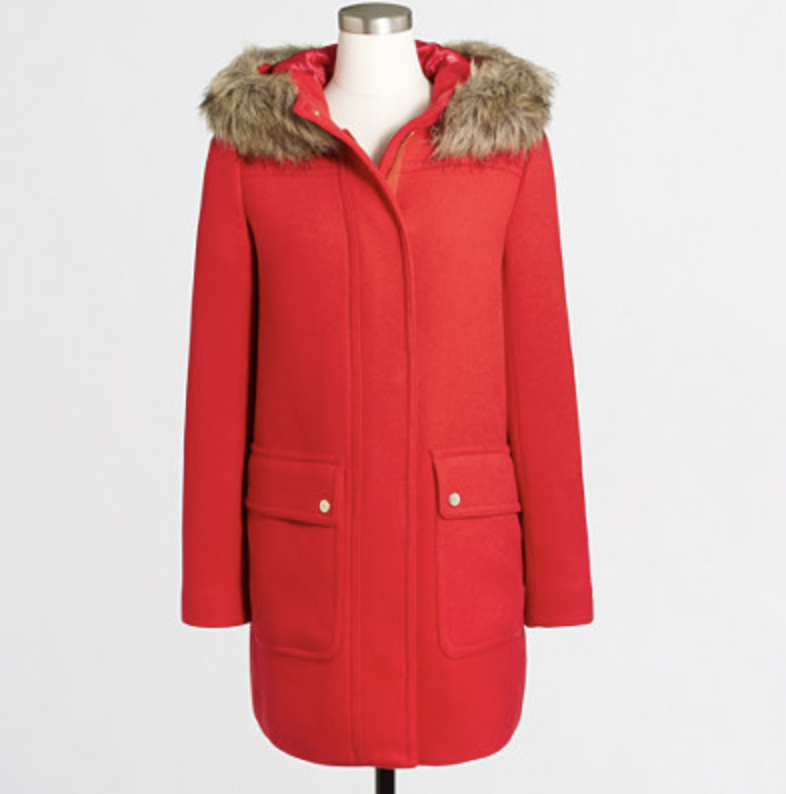 The lining is a satin-y cream colored material, and the faux fur collar is pure fun. 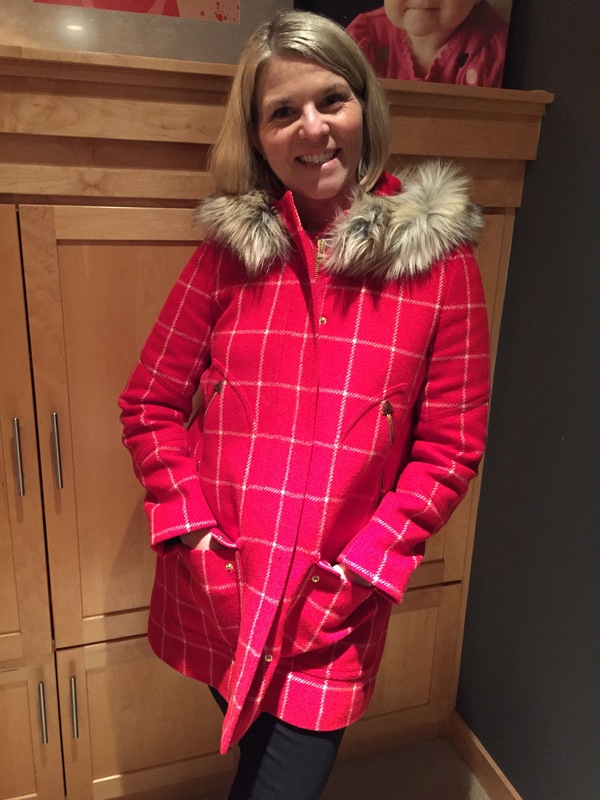 Final thoughts: This is probably not going to be an every day coat, but it’s a cheerful option for late winter when the temps warm up a bit and for days when a pop of color is in order. 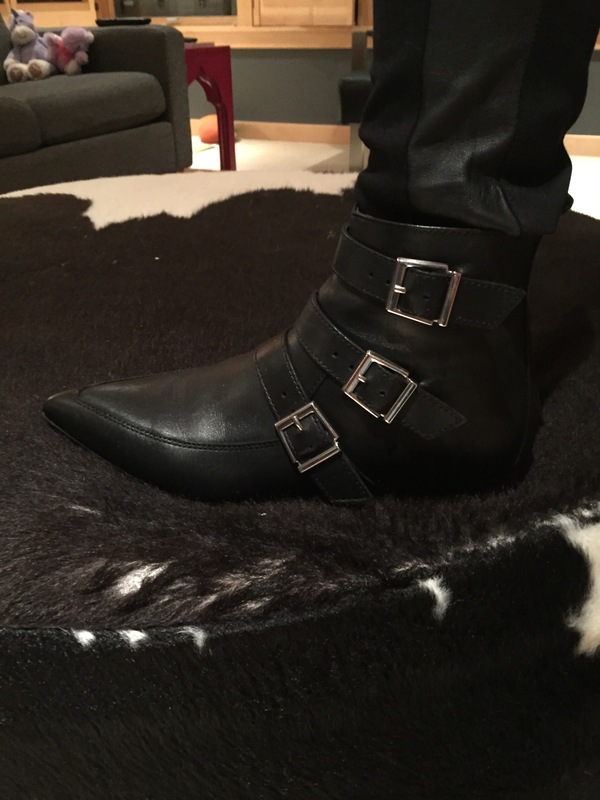 I also recently received these Steve Madden “Nari” boots for the outrageous price of $45. See my comment above about terrible photography. I am not sure why my pants look so bunchy in that picture. They really weren’t, I swear. There is also a stuffed unicorn sitting next to a stuffed bunny on the sofa in the background. 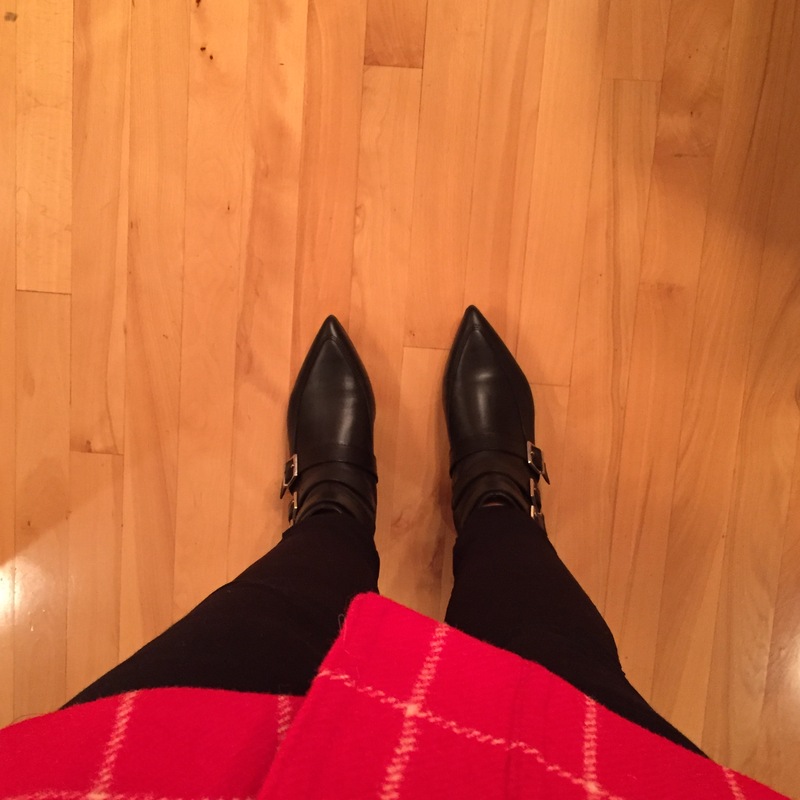 I bought these boots in a 9. I’d say that my real shoe size is about an 8.75, which of course does not exist. Sometimes if I gamble and buy a pair of pumps or sandals in a 9, they’re too big and I walk out of them. Boots are usually a safe bet to size up in, though, since they’re often paired with thick socks. Add the pointy toe effect of having less room in the toe box and the bigger size seems correct. Even in a 9, though, these boots were tight, both in the toe and the heel. I still kept them, although I wore them with two layers of thick socks for a few hours to stretch them a bit. It kind of worked. They’d be ok for going out to dinner or wearing for about half a day of work, but they’re not comfortable enough for travel or all-day walking. 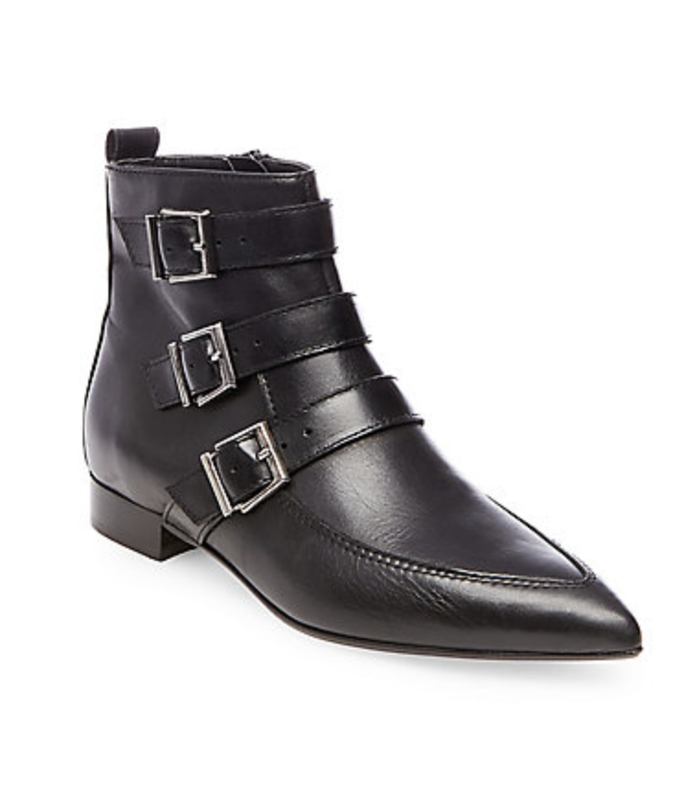 One more thing: these look like $45 boots. The original price was $150, which is still cheap for boots, but these look and seem inexpensive. Still, the style is edgier than what I normally wear, so I’m ok with these being a trend item and not a wardrobe classic. Especially for $45. Elizabeth & Clarke is a subscription box service for shirts. They release three designs per season and subscribers can sign up to receive one, two or three shirts. I was intrigued when I heard about this brand and signed up a year and a half ago. After about three boxes, I wasn’t feeling it and cancelled. This printed tee was from the Winter 2016 collection. I saw it on several blogs and immediately regretted cancelling my subscription. There is something about the trompe l’oiel chandelier-style design that made me fall in love. I also received an email inviting me back to Elizabeth & Clarke last month, with the further notice that all shirts will now be made with unstainable technology (which needs to be in my life) and that there would be a price increase on all subscriptions, but former subscribers could be grandfathered (grandmothered?) in with a discount. Ok, sold. I was too late for winter but picked two shirts for spring. I haven’t received them yet but will review once they come. I also already picked out summer, which feels tremendously far away. Shirts from past seasons are available to purchase if they are available, so I sent an inquiry about this top. It was still in stock and I could have it for $40, which I thought was worth it. The fabric is a nicer cotton than your standard long sleeve tee, and the print really sets it apart from almost anything else in my wardrobe. I ordered an 8 and the fit is perfect. 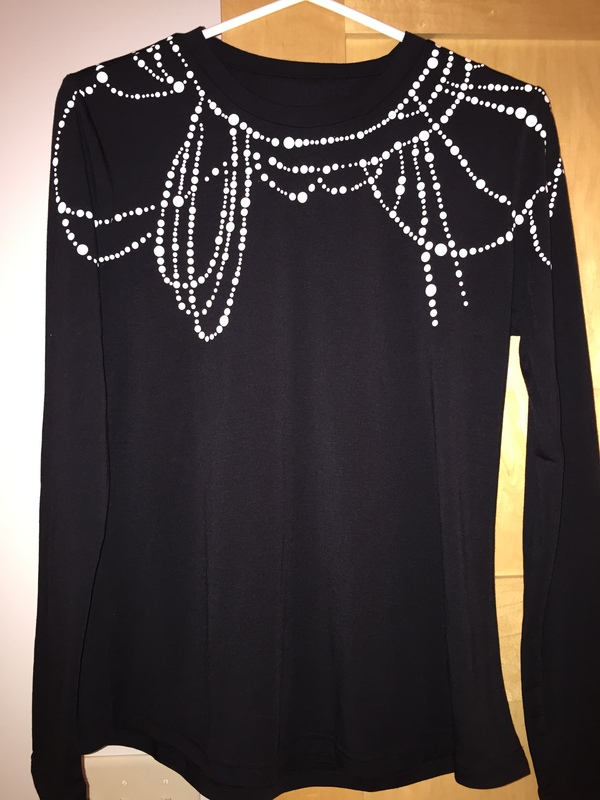 I think this could be dressed up enough for work with a skirt, but it’s probably better suited for the weekend or going somewhere like an upscale quick casual restaurant. It’s not quite Going Out material, but it’s not Running Errands attire, either.